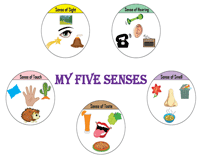 Conduct an interactive discussion to introduce the five sense organs. Follow up by using the show and tell, five senses charts to assist kids of kindergarten in relating the pictures to their body organs. This five-senses-and-their-uses chart shows the application of the sense organ in experiencing the objects shown. Correlate senses with their applications to experience things. Snip the word cards and pair them up with the organs they are associated with. 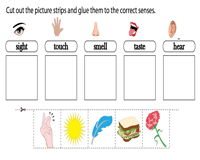 The word cards in this five sense activity worksheet facilitates first grade children in learning the spelling of each sense with ease. Get a pair of scissors and glue ready for this senses activity. Cut the picture boxes and glue them onto the sense used to experience it, in this human sense organs worksheet. 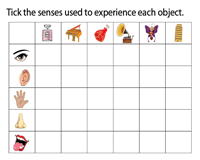 Teach one-to-one correspondence between the senses and their uses with this Kindergarten worksheet. Kids are expected to map pictures-to-pictures to identify the sense involved. Identify the object and ponder on which sense is used to experience it. 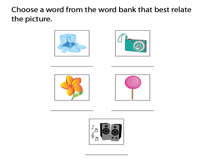 Connect the picture to the sense, in this matching worksheet for grade 1. Looking for a variant or do you want to raise the level? 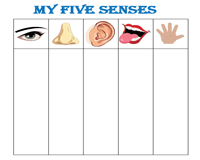 Then utilize this five senses matching worksheet for grade 2. Read the sentences carefully and contemplate on the sense used and match them. 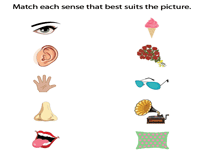 Choose an action word related to the senses from the word bank, that serves best in experiencing the objects in the picture; in this engaging five senses worksheet. Recommended for grade 1 children. 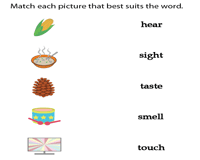 Read each sentence and complete it with a suitable word from the word box, utilizing this my five sense worksheet. Recapitulate and comprehend the significance of each sense in the process. Play the Blind Man's Bluff to explore the sense of sight. 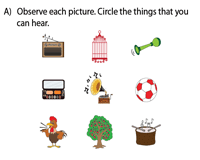 Put on your thinking caps, compare the five senses and circle the objects you can see but not hear, smell, taste or feel in this sense of sight worksheet. Have you ever played the game "Simon Says"? Exercise your listening skills with this game. Ponder over how your sense of hearing works and decide which of the things produce sounds. Draw two pictures as well. How does it feel when you have a stuffy nose? Or when you go past a bakery? Reflect on the sense of smell, observe the pictures and pick the ones that you can smell. Use your imagination to draw two more objects. How about a tasting party at school? Let's get kids to taste various food items and differentiate between them. 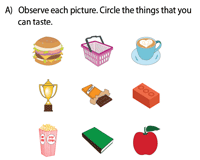 Contemplate on the pictures shown and choose those that can be tasted in this worksheet. Give the kids a 'feely bag' with objects of different textures and play the guessing game. Examine the pictures and select the things that can be touched and felt. Draw two objects with different textures. How often do we use more than one sense to accurately identify objects? 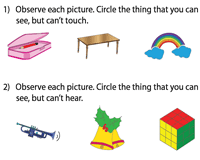 Use this worksheet to analyze which of the five senses could be used in recognizing the objects in the pictures and tick the appropriate senses (columns). Experimenting with the senses can be so much more fun with a 'Nature Walk'. Let the little scientists observe nature, investigate things around and record their findings employing the blank teacher template included in this section. Look around and make a list of things you see, hear, smell, taste and feel. Then segregate them according to the senses used in experiencing them. List them out in the appropriate columns.